How repeatable is evolution? That is, given similar starting conditions, and a similar amount of time, will multiple populations evolve towards the same outcome ('parallel evolution') or not? And, if they deviate from a shared evolutionary outcome, is that because of historical accidents unique to each population, or a more deterministic, adaptive process? 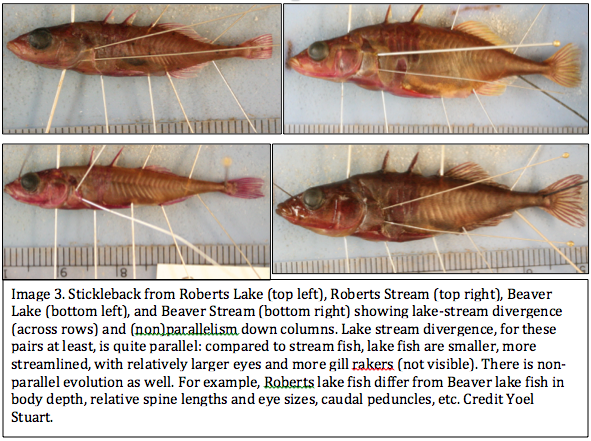 We set out to answer these questions by studying patterns of morphological, genetic, and environmental divergence among pairs of lake and stream populations of threespine stickleback fish (Image 1), on Vancouver Island. Vancouver Island was covered by a massive glacier until about 12,000 years ago. When the glacier thawed at the end of the last ice age, it left behind hundreds of freshwater lakes and streams (Image 2). 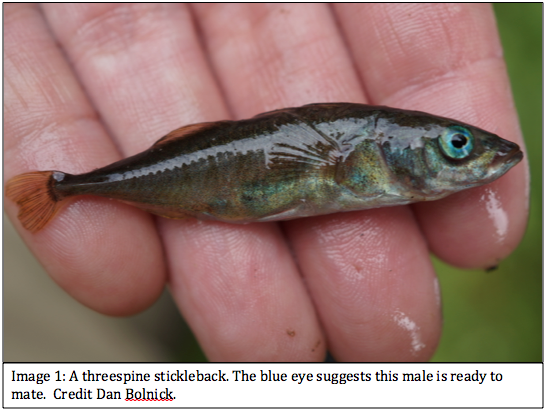 Shortly thereafter, an ocean-dwelling fish, the threespine stickleback, swam upriver to found permanent lake and stream populations. Crucially, each watershed was colonized (roughly) independently by (roughly) the same oceanic genotypes. As a result, Vancouver Island hosts a ‘natural experiment’: each watershed is an independent instance of evolution by stickleback from similar starting conditions. So, did they evolve to the same end-point or not (Image 3)? Specifically, we asked (1) whether stickleback from adjacent lake and stream populations are morphologically and genetically divergent; (2) whether replicate lake-stream pairs (independently evolved in different watersheds) have diverged to the same magnitude, in the same directions; and (3) what might explain lake-stream evolution that is not strictly parallel. To the field! We planned to collect extensive morphological, genetic, and environmental data for each stickleback lake-stream pair, while maximizing the number of pairs visited. 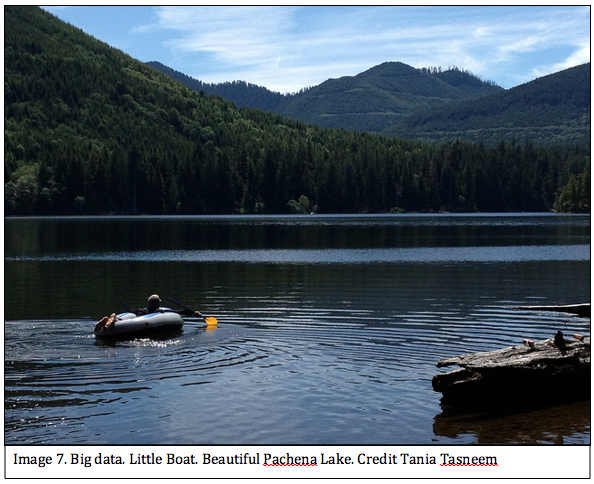 Targeting eighty fish and environmental data from each of sixteen lake and stream pairs seemed ambitious but possible with a large enough work force. 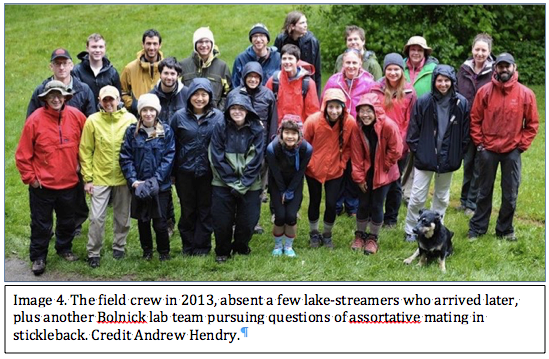 In May 2013, we convened that work force—a gigantic field team, comprising two sub teams totaling four professors, two postdocs, two graduate students, five undergrads, and three middle school science teachers (Image 4). A typical day consisted of bushwhacking in the rain, setting 50 minnow traps in the rain, collecting fish in the rain, sampling for DNA and preserving fish under a tarp to stay out of the rain, and spending several waterlogged hours in lake or stream collecting habitat data, in the rain (Image 5). At our fastest, we sampled one population in one day. At our slowest, when fish were not abundant or avoided our traps, we slogged through one population in four days. By the end, in mid-July, we had amassed 2,500 fish from 16 pairs (32 populations! plus 3 marine populations), pickled in formalin and ready for processing. It was an epic field season. It was only the beginning. The real grind began back in the lab (where it was dry, at least). 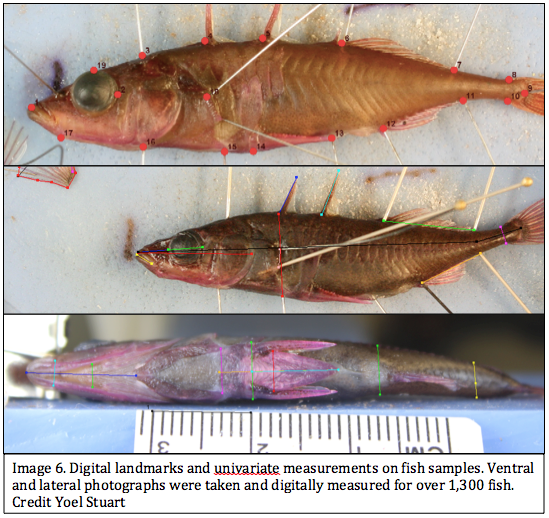 There, two postdocs and two undergraduates worked for two years to photograph and dissect fish to measure nearly 100 morphological traits (Image 6), digitize field data sheets, extract and sequence DNA, process the DNA data through bioinformatics pipelines, scan for parasites, and identify food items in stomachs. Even just managing and curating the resultant data into analyzable form required the recruitment of another postdoc for several months. By early 2016, we had tens of gigabytes of genomic data, thousands of fish’s worth of morphological measurements, and environmental, parasite, and stomach content data for all 32 sites. It was a monumental dataset, intimidating and exciting at the same time. We required a year, and the help of yet another postdoc, to fully analyze the data, write the manuscript, and advance the manuscript through review. Science is slow! What did we find? First, genetic exchange between adjoining populations constrains divergence, as expected. The higher the gene flow, the smaller the lake-stream divergence. But which traits were diverging varied: divergence was sometimes very parallel, sometimes not at all, depending on which watersheds we were comparing. This heterogeneity was explained by the environmental data. Not all lakes are the same, and not all streams are the same. Variation within each habitat 'category' (lake or stream) predicted which lake-stream pairs would be highly parallel, or deviate from parallel. Thus, morphological evolution is non-parallel in part because of adaptation to non-parallel selection. Evolution is partly repeatable, but even some of the non-repeatable variation can be attributed to adaptation. Like most science, this project was not fast. It was not easy. It has been a dedicated collaboration spanning almost a decade, with multiple researchers who complemented each other’s skills and expertise, shared their ideas, buoyed morale through difficult times, and shared in the beauty of remote field locations (Images 2, 5, 7), successful data collection and analysis, and scientific story telling. We feel that this work will advance the field by underscoring that parallelism is a continuum, and that novel insights into the evolutionary process arise from moving beyond “is evolution repeatable?” to “how repeatable is evolution, and why?”. The paper in Nature ecology & evolution. Read Dan Bolnick, Katie Peichel and Andrew Hendry's recountings of the history of this study here. 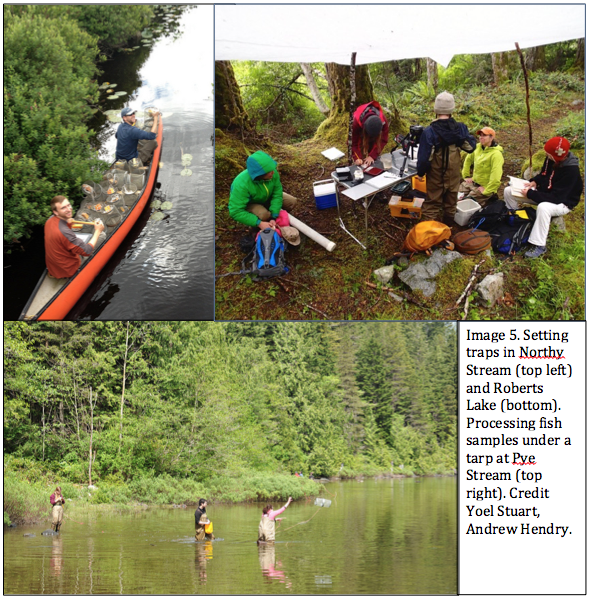 Find many more images and videos of field work on Vancouver Island at the following links. Really enjoyed the paper & blog post, Yoel. I have a question that may stem from an unfamiliarity with analyzing genomic datasets. In the paper (and above), you say that more gene flow leads to lower [phenotypic] divergence--this makes good sense and is an important result. My question has to do with the way this hypothesis was tested, namely using genomic data to infer gene flow, and then evaluating the correlation between gene flow and phenotypic divergence. My understanding is that you calculated genomic differentiation using loci that were probably neutral, and then regressed that against phenotypic divergence using the (very intuitive and well-explained) vector angle/magnitude differences. OK, so here's the question: what would it take to not get this result? That is, what process would decouple phenotypic and genomic divergence at neutral loci? In stickleback, for example, we expect phenotypic similarity to be correlated with pre-mating isolation. So could we just say that this result implies that populations that are at an earlier stage of divergence have weaker assortative mating? Is it possible that some of the remaining loci are under divergent selection, and the correlation simply reflects the fact that pairs with weaker phenotypic divergence have less divergent genomes? Glad you enjoyed the paper and post. Thanks for the excellent question. I wanted to think on it a bit, hence the slow reply. We do find that neutral genetic divergence is at least partially decoupled from phenotypic divergence. That is, angle between any two divergence vectors in neutral genotype space (thetaG) is not correlated with the angle in phenotype space (thetaP). 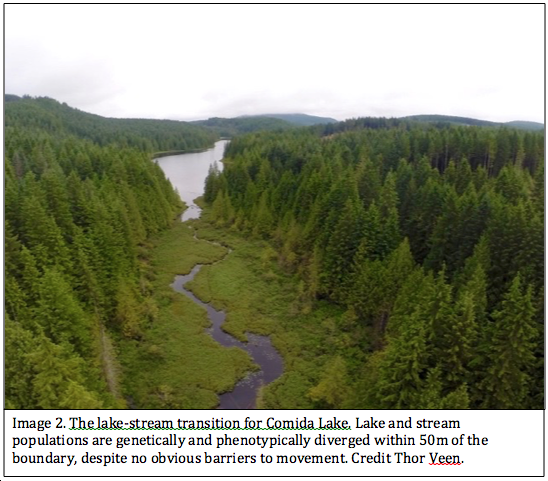 In other words, direction of lake-stream divergence in phenotype space doesn’t seem to match up with directions of lake-stream divergence in neutral genotype space. This makes some sense; it’s the selected/adaptive loci that determine which traits diverge and how, and, indeed, the number of shared outlier loci (thetaOutliers) correlates negatively with smaller thetaP. On the other hand, as you’ve pointed out, the magnitude of divergence in neutral loci (Lg) corresponds positively with the magnitude of divergence in phenotype (Lp). Can this relationship be decoupled? In the univariate case, I suppose it could, if the focal trait had simple genetic architecture and was under divergent selection that varied among pairs; in this case, the magnitude of trait divergence would vary according to selection, without necessarily corresponding to magnitudes of neutral genetic divergence calculated from the rest of the genome. There are a number of cases (some adaptive radiations, for example) where there is large morphological divergence, but little neutral genetic divergence (and the genetic architecture of that divergence is simple). Conversely, there are a number of cases where there is large neutral genetic divergence but no morphological divergence (e.g., cryptic species). For our specific multivariate phenotypic case, however, (1) most traits are going to be multigenic, (2) Lp is multivariate, calculated from all traits, and (3) importantly, some traits (in some pairs) are under divergent selection while others aren’t (therefore, the underlying genetic architecture of the non-diverging traits is neutrally evolving with respect to lake-stream and will be part of Lg). Given this, I think you’re right that Lp-LG relationship is expected in our multivariate case. If the relationship simply reflects that pairs with less phenotypic divergence have less divergent genomes, I guess one could ask: "what causes less divergence in phenotype or genotype?" For phenotype, we conclude that variation in environment (ie. natural selection) sets the direction of divergence in phenotype. This is supported by the observation that shared outlier (i.e., selected) loci correspond with smaller angles between pairs. We conclude that the magnitude of that divergence is constrained by gene flow (itself inferred from Lg vector lengths and corroborated by ABC estimation number of lake-stream migrants in each pair). We reject the alternative causal direction--that adaptive divergence constrains gene flow-- because the length of the neutral genetic divergence vector is not correlated with the length of the environmental divergence vector, which might be true if ecological speciation/assortative mating in different habitats reduced gene flow across the entire genome. I'm not sure I fully understood the question, though, so I might be talking past you. Could you reframe? Thank you for the detailed response. The reason for my (much slower) reply has both to do with needing time to think about this, but also with only having two hands to make stickleback crosses! I’ll need to digest the result about the angles some more. It seems that if there was a 'general' [apostrophes just for emphasis] relationship between neutral divergence and phenotypic divergence, then, you’re right, you’d get correlated 'thetaG' and 'thetaP'. As I write, it’s tough for me to understand why if there’s gene flow constraining phenotypic divergence, then the angles wouldn’t be correlated as well. Why does gene flow affect length but not angle? The observation that the length of the neutral divergence vector is uncorrelated with the length of the environment divergence vector, while the latter is correlated with phenotypic divergence (Fig. 4A) is good evidence in support of your conclusion. I suppose this all rests on the trend depicted in Fig. 4A being ‘real’. I am inclined to believe it, you anticipated my question about outliers in the caption, and because I’ve seen pretty noisy stickleback data before! Nonetheless, it is interesting to me how little variation in phenotype is explained by the measured environmental variables (8% or so, it seems). Is it possible that this leaves open the possibility that some unmeasured variation in the environment is driving the relationship between ‘Lg’ and ‘Lp’, and thus that the opposite causal relationship is plausible? This last point is certainly very speculative, and your conclusion is most consistent with the data that are at hand. Enjoyed the paper and looking forward to following this story into the future. I think about gene flow's impact on angle versus length as follows. Consider the most parallel, lake-stream divergent trait, gill rakers. Lake fish almost always have more gill rakers than stream fish, presumably because differences in diet (more plankton in lakes) selects for more gill rakers in lakes. Lake-stream gene flow within a pair will tend to homogenize the populations, thereby reducing divergence in gill rakers, and resulting in shorter vector lengths. However, selection should still favor lakes having more gill rakers than streams. So to the extent that selection overcomes gene flow, the direction of divergence will still be the same. Expanded to the multivariate case, I think this is how gene flow might affect vector length, without affecting vector direction (and therefore the angles between vectors). Of course, this depends on trait correlations, which is something we're actively investigating. It certainly would be nice to be better able to measure environment, I agree. And to better understand how fish experience the environment. Hope your field season is going well. Good luck finding some signal amongst the noisy stickleback.